C’mon, admit it! Today’s video games, regardless of their quality graphics and online gaming communities, just don’t quite give you the same thrill as a good old arcade experience! Come on out with your family to Funagin’s and challenge each other to high scores on any of our dozens of full size arcade games. The lights, the noise, the joysticks. It’s all part of the experience. An arcade adventure is a perfect not-boring date night! And it’ll keep the Scout Troop happy all weekend. Want to challenge co-workers or just give them something completely new and unique for team-building? 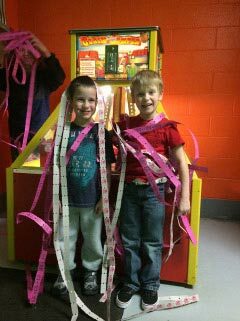 Come to the arcade. Share your favorites with your kids and show them how it all started. If your group is already visiting the laser tag arena or has a reserved time for paintball, you’re free to visit the arcade. Maybe it’s just a family night out with the kids. In that case, be sure to visit our inflatable adventure area as well once you’ve conquered all the arcade games you can handle! However you decide to spend your night, spend it at Funagin’s! Having a birthday party? Learn more here.